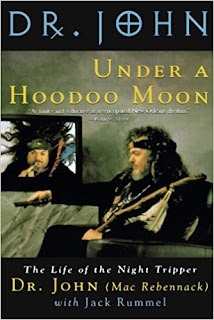 Check out the Dr Mac's autobiography 'Under a Hoodoo Moon' if you what a rattling good read. It must be my only book on the shelfs here at Swappers Mansions library (it's down past the Dungeon beyond the ha-ha) that is almost entirely written in patois! You get into it and can hear Mac reading it in your head if you listen!! On this day in music history: February 25, 1973 - “In The Right Place”, the sixth album by Dr. John is released. Produced by Allen Toussaint, it is recorded at Sea-Saint Studios in New Orleans, LA in Late 1972. After recording several acclaimed, but moderate selling albums, the New Orleans born musician and songwriter finally makes his commercial breakthrough with his sixth release. Working with legendary songwriter and musician Allen Toussaint, the producer surrounds John with a group of top notch musicians including The Meters, Ralph MacDonald, and David Spinozza. Sporting a more funk oriented sound than his previous albums, it spins off two singles including “Right Place, Wrong Time” (#9 Pop, #19 R&B) which become his most successful single. The original vinyl LP is issued in a tri-fold sleeve, that is discontinued on later pressings, reverting to a single pocket sleeve. First reissued on CD in the mid 90’s, “Right Place” is reissued on translucent orange vinyl in 2012. Another limited LP reissue pressed on multi-colored vinyl (orange, yellow and green) is released by Rhino Records in 2015. “In The Right Place” peaks at number twenty four on the Billboard Top 200.